In 1967 Ronald Barthe published Elements of Semiology, which stands as a temporal marker of post-structuralism, where he gave rise to the idea of “Meta Language”, which in fact “beyond language” or “Second-order language” which is used to describe, explain or interpret a “First order language”. Each order of language implicitly relies on a metalanguage by which it is explained. And it is obvious that the translations between the first order and the second order never loss-less and the true meaning of the first order language is lost or deteriorates when it is represented in “Second-order language”. Design process involving multiple intersections of information communication and sharing through translation of the value (e.g. vision, idea), loses its original meaning while being translated through different tools into various forms of expressions. Also, the different roles (e.g. Product stakeholder or product manager, information architect, interaction designer, visual designer, prototyper and developer etc. ) contribute to the infinite regression of “meaning” of the value. That’s why one of the key factors that working with developers in terms of the realization of the design has always been a big pain and non-stop iterations, and this turning in favour of the term Full-stack Designer that shares the same spirits as that of the term Full-stack Developer. So if we see that one of the major focus of DesOps in this aspect involving the work-culture is to reduce the gaps between the roles and wastage thereby. The translation from one role and discipline to another makes the meaning second-hand interpretation and such process is never loss-less. Something or the other gets lost in translation, as we progress towards the realization of the value or the product. So by implementing Lean methodologies and by striving towards having minimally sized team members with as diversified expertized to help to minimize the intersections or touch points among disciplines and roles where the translation happens. In short less need to translate the value, the less information gets lost and less is the waste in terms of value, effort, cost and time. Going “full-stack” is one approach to avoid the waste that happens in the process that Barthe has termed as indefinite regression or Aporia . This is mostly from the roles perspective. The other approach is through process or work practices redesign to reduce the number of intersections where the translation happens. In the context of DesOps, this is significant, as it involves the interactions at various levels between the primary two entities i.e. human (i.e.people or user ) and machine, namely — from human-to-human, human-to-machine, machine-to-human and machine-to-machine. 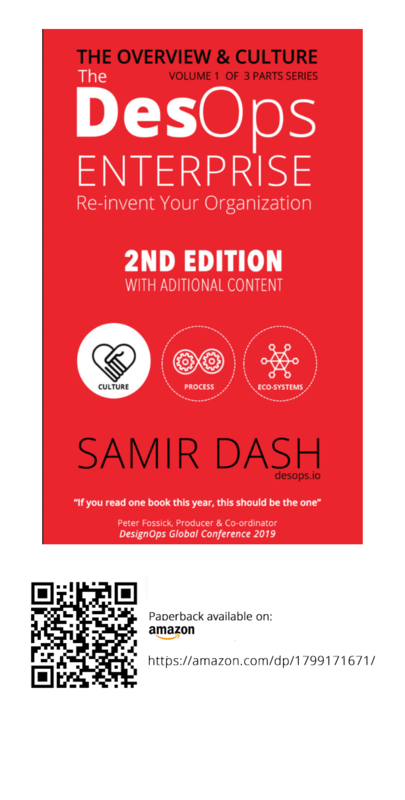 So one of the key factors involved while implementing the DesOps in the organization is to look for process re-design to “minimize the touch points of interaction” through the principle that advocates to minimize the gaps between the roles. 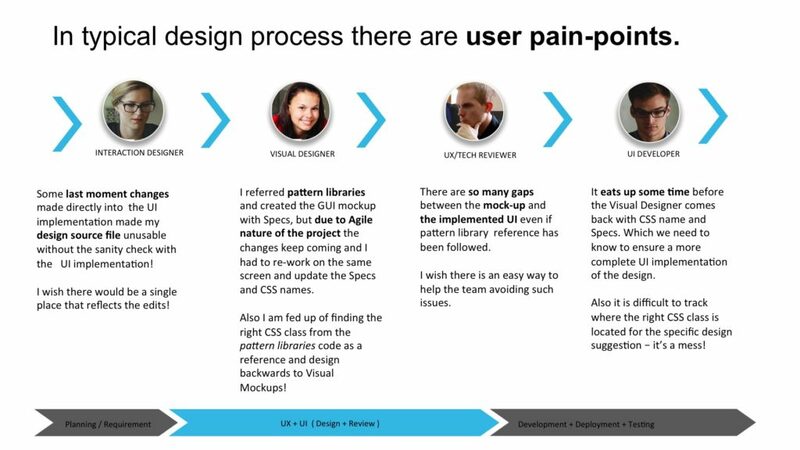 Sometime back, I was evaluating some of the design systems and tools available to study the pain-points while transitioning the design concept from one tool to another and moving from one role to the other. I got in touch with many of my friends who were designers by profession in different enterprises and were at different levels of comforts with existing design and wireframing toolsets, starting from Adobe Suite to the Sketch based eco-systems. Based on the discussions, the interesting thing that I found was many of the tools being used at different organizations, are selected based on the pricing and what the team is comfortable working with, rather than with a focus to have a seamless workflow. In many cases, the cost played a bigger role and due to licence cost, some had switched from most popular design tools to the cheaper replacements. However, the biggest struggle that was there was never solved i.e. the iterations in the design process remained challenging despite the change in tools. Every change in design aspect that was iterated was facing the overshoot of the effort, time and cost. The transitions of value from one set of tool to the other e.g. the quick wireframe created in Powerpoint during the stakeholder workshops were being translated into Photoshop was actually about relooking at the layout due to the constraint that popped up while working with the specific widgets in a specific resolution that never went well the wireframe concept. In one organization, the team replaced the Powerpoint with Sketch and tried to use that to complete the process, which turned into a nightmare as the sessions ended with the people struggling with the tool. In search of a tool that can minimize the translations of values, I was toying with an idea of Ditto, a simplified version of the tool that can look familiar to the different roles involved in the process and at the same time it will align with a process that is about having the same source files at any of the stages of the process and can align with any design system with easy configuration mechanism. Ditto is a conceptual vision of a design tool that uses UI pattern Library (which is configurable ) and understands the relationships among the components of the design system configured to create and maintain its own objects that can be rendered on a super simple easy-to-follow and familiar looking interface with drag and drop kind interactions enabling the users of different role to focus on their goal rather than figuring out how to use the tool. Conceptually Ditto was capable of taking any type of inputs and exporting different types of outputs on demand e.g. the wireframes, visual comps and ready to deploy UI coded with HTML/ CSS/JS. The benefit of such a tool would be to reduce the critical – dependency on any particular role in the team in order to carry out with the project. For example, assuming a startup is only having a visionary guy with a developer, he can go into the tool to drag-drop few shapes and objects in a traditional Powerpoint / Keynote kind of interface which he is familiar with and export that as a barebone interactive code/prototype that can be tested. He can continuously test and get feedback, based on which he can tweak the same source and iterate. His developer friend can use the same source to export the code in a click to use in the production. And interestingly if he makes any change, that would be updated back to the same source. Later if a visual designer’s help is taken to customize the look and feel, it would allow updating the same source that’s running in the production where the necessary changes to the code will be managed by Ditto in the background. And despite the fact that the visual designer modified the source, (which affects the internal code) he is doing that in a Photoshop kind of environment familiar to him. If we look at this “Single Source Based Design Eco-System“, any role can enter and come out with a production-ready code, be it a product owner or CEO of the startup, or an interaction designer, visual designer or a UI developer. Single source makes it maintainable. Single user – Single Tool: makes it easy for any of the roles can login and generate implementation ready UI output. Boon for Agile projects where the changes are common. Some of the components of the conceptual design tool Ditto, you might have noticed are already available in some of the design tools. For example, similar in Sketch, you can create a custom pattern library theme and use drag and drop to add them while you are designing. But, its more about customizing themes based on existing ones and exporting shapes specific CSS at the end, which is at a very lower level of maturity from a design system standpoint. Similarly, exporting existing design to HTML feature from Adobe’s Creative Cloud Extract in some sense does not take account into how certain design systems of high maturity can be fit into it so that the output can have functional interactions as a part of business flow for the UI. But certainly, Bootstrap Studio is much closer to the concept of Ditto. It can be improved around the areas configurations and there is a need to move away from the traditional Application type UI and interaction layer so that it can align to one of the core attributes i.e. to make each user role feel familiar with the interface or rather making it easy to follow. The UI widget based WordPress-page builder tools like Elementor are closer in this regard. 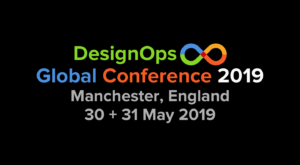 While talking about Eco-Systems the tools and technologies, I will write about what are the tool-chains that we can combine for different levels of DesOps implementation looking at the maturity levels of Design Systems in play in the organizations. Well, the thoughts presented above is a practical example of conceptualizing a value communication using improvements in processes and using technology to applying regression to the touch points where the translation happens, and thereby reducing waste and avoiding loss of meaning of value throughout the design process. We will explore the aspect of communication aspect of human-to-human, that is an important part of DesOps culture. Stay tuned. (c)2018 , Samir Dash. All rights reserved.